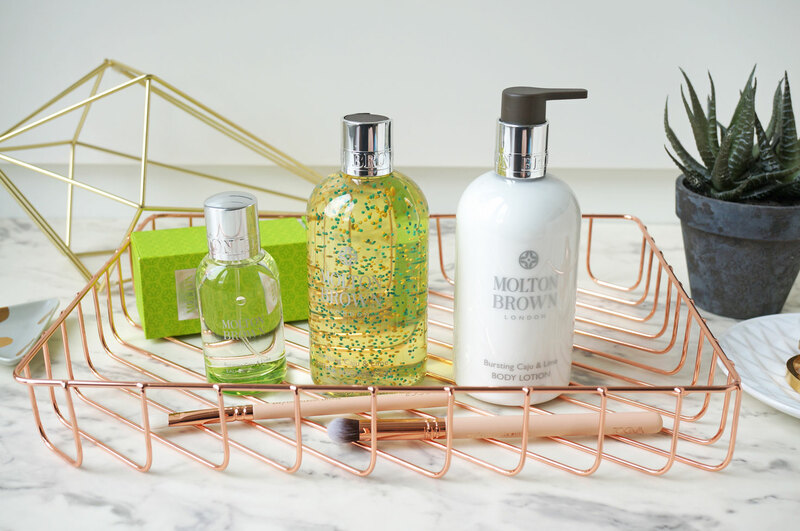 Molton Brown is easily one of my favourite bath and body brands, and I get incredibly excited when they launch new products – I mean who doesn’t want a fabulously scented bath or shower? One of their latest ranges is the Limited Edition Bursting Caju & Lime Collection, which is right up my street. The fragrance is fresh, zesty and energising – which is exactly what I need first thing in the morning. When I was creating this citrus fragrance, I was excited to bring to life the vibrancy and spark of Brazil’s caipirinha cocktail – the first fresh sip on a hot summer’s day. The top notes of caipirinha accord are refreshing with a squeeze of zesty lime, grapefruit, lemon and orange. To lift it even more, a dash of spearmint is added – crisp, just like the cocktail. To give that humid finish, woody fig tree and oak moss mix perfectly with upbeat green galbanum. – Jennifer Jambon, Principal Perfumer, Molton Brown. Starting with the Bursting Caju & Lime EDT (£39.00) – this is a clean, fresh and zesty eau de toilette, with no specific gender in mind. This fragrance really is for everyone, evoking the lively ambience of Brazil’s colourful carnival and spontaneous nights, this scent is perfect for those looking for something zingy and bright. Top notes: Lime, Grapefruit, Orange and Lemon. Heart notes: Spearmint, Clary Sage, Galbanum and Cypress. Base notes: Musk and Oak Moss. The Bursting Caju & Lime Bath & Shower Gel (£20.00) – matches the EDT perfectly. This is an energising bath and shower gel blended with lime accord, spearmint and caju fruit extract with a base of Amazonian forest accord to evoke the bright mornings and spontaneous nights of Brazil. And lastly the Bursting Caju & Lime Body Lotion (£25.00) – with the same fragrance as the Bath & Shower Gel, this luxuriously smooth body lotion is the perfect finish to your bath time routine, leaving skin smelling fresh and vibrant. Previous Post My NYC Sephora Haul! Feat. Kat Von D, Milk Makeup, Tatcha, Becca & More!